. 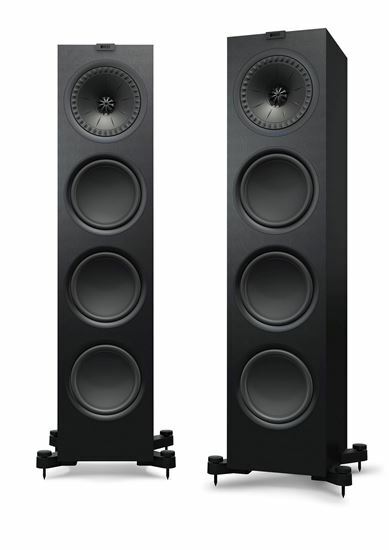 KEF Floor standing Speaker. Two & half-way bass reflex. KEF Floor standing Speaker. Two & half-way bass reflex. Q950 is the flagship model of the Q Series range, featuring the KEF signature Uni-Q driver array paired with 200mm (8 inches) long-throw bass driver and matching ABRs. With the latest enhancement in acoustics and design, Q950 brings high-resolution sound with extraordinary depth and exceptional clarity. At the heart of the evolved Q Series is the Uni-Q driver array. The signature innovation places the tweeter in the acoustic centre of the midrange and bass cone, bringing the acoustic idea of a single point source closer than ever to realisation. The result is a more detailed, accurate three-dimensional sound image, which is dispersed more evenly throughout the room than is possible with any conventional speaker. Uni-Q's ultra-wide dispersion is further enhanced through KEF's 'tangerine' waveguide over the tweeter dome. The closed box midrange cabinet design reduces the load on the Uni-Q midrange cone, increasing clarity and detail while delivering cleaner, punchier bass. Midrange clarity is enhanced again through improvements to the midbass driver that allowed the DC blocking capacitor to be eliminated. Its removal also created a more natural bass roll-off between the drivers.